S I G N & D I G I T A L G R A P H I C S • May 2018 • 23 Precision Machinery With the advanced equipment that is available for all channel letter bending needs, users need to understand what to use and how to use it. Machine manufac- turers can provide a breadth of knowl- edge in this area, and are happy to assist sign makers with equipment decisions. In some instances, becoming a trusted partner of sign shops. "In my opinion, it is never appropriate to not use automated equipment," states Trea Sciortino, owner, Letter Fab LLC, a wholesale channel letter provider in Crested Butte, Colorado. "The equip- ment available is CNC router tables, CNC letter bending machines, Automated trim-cap machines and clinch machines, to name the most important. There are many custom-made tools in our shop as well as a skilled group of tradesmen to make a superior product." Before automated letter bending product lines existed, sign makers were content with performing each job by hand. But when the need for mass pro- duction and replication increased, today's equipment filled a gaping need. "Now, we use a machine to do all that work," says Kevin Kane, owner, CLN of South Florida, a manufacturer of a variety of automated channel letter equipment. "A channel letter machine and router table and a Quick Trim machine; this has let sign makers make more money than ever, producing letters faster than ever. Even the smallest shop can take advan- tage of this equipment, getting off the metal bench and back to a new customer. What's your time worth?" Channel letter bending machines bring necessary advantages to the sign maker including greater speed, accuracy and overall productivity. 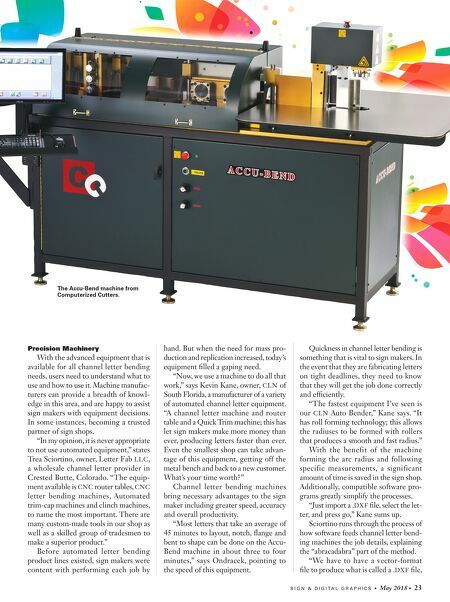 "Most letters that take an average of 45 minutes to layout, notch, flange and bent to shape can be done on the Accu- Bend machine in about three to four minutes," says Ondracek, pointing to the speed of this equipment. Quickness in channel letter bending is something that is vital to sign makers. In the event that they are fabricating letters on tight deadlines, they need to know that they will get the job done correctly and efficiently. "The fastest equipment I've seen is our CLN Auto Bender," Kane says. "It has roll forming technology; this allows the radiuses to be formed with rollers that produces a smooth and fast radius." With the benefit of the machine forming the arc radius and following specific measurements, a significant amount of time is saved in the sign shop. Additionally, compatible software pro- grams greatly simplify the processes. "Just import a . DXF file, select the let- ter, and press go," Kane sums up. 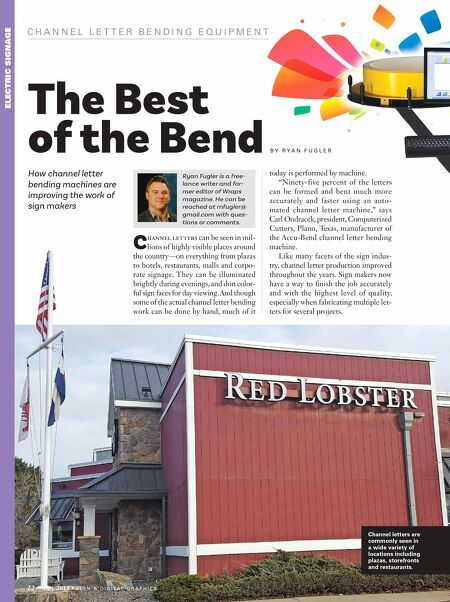 Sciortino runs through the process of how software feeds channel letter bend- ing machines the job details, explaining the "abracadabra" part of the method. "We have to have a vector-format file to produce what is called a . DXF file, The Accu-Bend machine from Computerized Cutters.